Posted on 5th August 2011 by Chris. Controliss motorised window blinds are exceptionally convenient appliances to have in the home during the summer, since they can reduce air conditioning bills by blocking the sunlight that would otherwise add to the heat in your home, and can be remotely operated at your leisure with the single push of a button. While these will remove one of the more bothersome aspects of a sweltering summer's day, you can attain solar powered instruments that can benefit greatly from the intense sunlight of such a day. Here are some examples of devices you might not have heard of. You may already have solar powered lights in the garden to adorn your flowerbeds. But if you are considering getting, or already have a deck or patio, the fabulous Moonrays 95028 Mini Deck Light could be the ideal lighting solution for this area. The Mini Deck Light's AA NiCd rechargeable battery is charged by the sun's rays, so no wiring is required to power the light and therefore it can simply be screwed down wherever you want it. Voltaic Systems have various compact products that generate and store their own power. 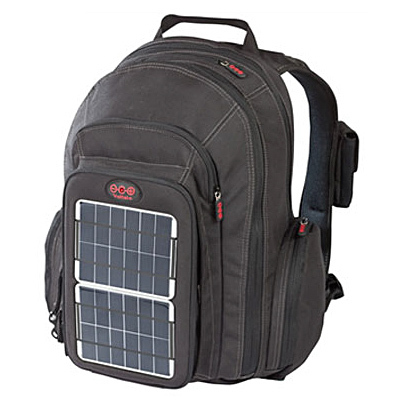 One range in particular is their bags and backpacks, that contain a power pack which is chargeable from an AC or DC supply, or it can charged while out and about from the solar panels built into the bag. This power pack will supply charge to many different electronic devices via USB port or using various standard adaptors included with the product. A Voltiac Solar Bag/Backpack would be a valuable gadget to anyone who is regularly on the move and can not afford to lose power in their mobile phone while expecting important phone calls. Other products that are not actually solar powered, but could add to the enjoyment of your summer outings are the RoadPro SnackMaster and the Spa-N-A-Box. RoadPro's SnackMaster is a portable beverage and snack cooler/warmer that plugs into a 12V DC cigarette lighter socket. The shelf on the inside can be removed to give more space or to store larger items, it also has a sealed door with a clear thermal pane window to allow you to see into the cooler/warmer and when warming, it can shut itself off automatically to prevent overheating. The Spa-N-A-Box by Comfort Line Products is a hot tub that can be set up in 20 minutes, requires no plumbing and can be packed away into 2 boxes for portability. To set up the spa, the panels and tub liner are fitted together, the tub is then filled from a garden hose and the control unit is plugged into a 13 Amp power supply. Once the water has warmed, 4 to 6 people can share the tub as the TurboWave jet system massages and the dual filtration ensures the water is kept clean. There are an increasingly vast array of everyday products available that can be solar powered so don't let the sun's heat drain all your energy this summer, keep yourself cool and let the sun's light empower you to step outside and enjoy the season. Has Anyone Seen The Keys? Posted on 4th August 2011 by Andy. When it comes to home security, Controliss automatically operated electric blinds can offer significant peace of mind. 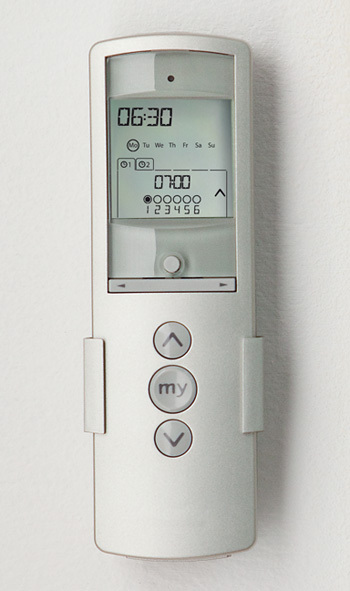 When controlled with a Controliss programmable remote control handset, your window blinds will operate automatically at a specified times of the day, giving the impression that you are at home, even if you are miles away. Of course, the typical way we cast our home security fears aside is by locking our doors and security system. Developers are continually trying to establish a better system than the everyday, often hard to find, house key. Say hello to your new front door key! It’s not a key as you would normally remember, that’s because Yale have invented the Keyfree locking system. It’s very similar to the system we now use to unlock our cars, which is remote control. It’s incredibly easy to use and is great for peace of mind, especially when you’ve just got back from the weekly food shop and it’s raining. Trying to find your keys in the bottom of the bag, whilst holding a load of shopping bags that are ready to burst, and getting wet, isn’t everyone’s idea of fun. With the Yale Keyfree, you can sit in the car, unlock the front door from your seat and, hey presto, you’re straight in with minimum fuss. The key will even talk to you if you want it to. So no more rummaging for keys in your bag, no more key cutting for spares, it is one simple system, which is battery powered. Even if the batteries fail, it still works with its backup emergency power. If you head upstairs and forget to lock the front door, not a problem, one press and you’re safe and secure. 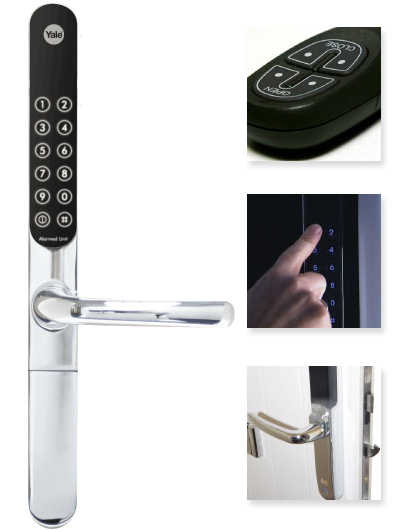 The Key Free Locking system comes as part of the handle and locking mechanism inside a multipoint locking door. You have a keypad on the inside, which also works as an alarm, so you can enter a code to lock and unlock, and the alarm sounds if anyone tries to tamper with the door. The remote key fob can lock and unlock from 10 meters away, and there is a slot for a normal key, which will override the system. So you have your remote control key for your car, your TV remote, your Controliss blinds remote and now you can lock and unlock your front and back doors with the Yale Keyfree Remote! Posted on 1st August 2011 by Chris. The evolution of the latest home automation 'mod-cons', that start out as a gimmicky gadget and then often become a common home appliance, is driven by our desire for added functionality and convenience. Many appliances can now fully automate - or lessen the effort required for - everyday tasks in all areas of the home. Our own remote control blinds can be fully automated to operate at certain times of the day, offering the highest in convenience for window blind operation. The kitchen is a major area for ever-improving functionality in appliances. Predictions for the kitchen of the future involve devices that utilise modern technology and materials to reduce the amount of hard work necessary to get what you want from your kitchen. 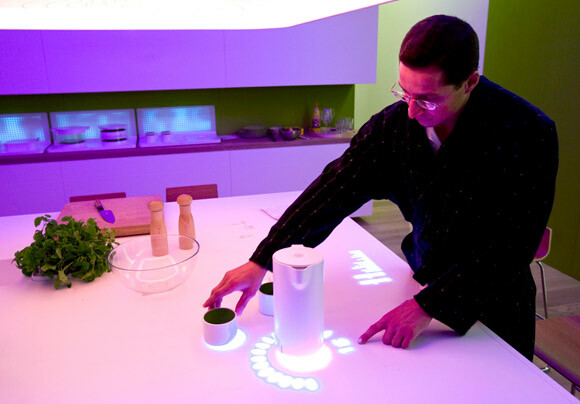 Examples of the appliances that could be coming into the home kitchen include a remote controlled cooker that will switch itself on to be ready as soon as the user returns home, a smart fridge that incorporates a display to show information such as your nutritional needs, and the captivating idea of a 3D food fabricating printer. The sales of 3D printers has been rising since 2003 and, consequently, the costs have decreased. The 3D food printer is currently only at the design and development stage, but has the potential to transform the way we obtain certain foods by offering a choice of foods that can be fabricated, in the home, from liquids, gels or pastes that are loaded into the 'printer' in the form of cartridges. Another interesting development in kitchen technology, that is closer to becoming domestically available, is Philips Green Cuisine Concept. The Green Cuisine features a large centre island tabletop that will sense everything you set down on it and can cook or cool food and beverages wherever they are placed. In accordance with the increasing eco-friendly nature of home appliances, beneath the tabletop is a composter that could allow you to reuse much of your waste. Smart appliances can even be obtained today that are unlikely to look out of place once the kitchen is filled with future hi-tech conveniences. 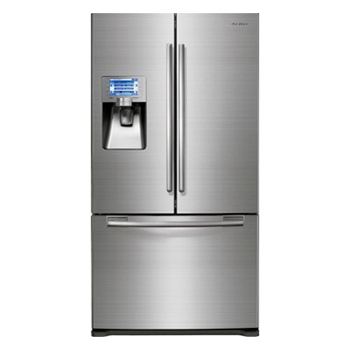 In particular, the stylish, yet practical, design of the Samsung RFG299 French Door Refrigerator shows a lot of consideration with regards to maximising the product's storage space. It uses urethane insulation, that allows the wall thickness to be reduced while remaining just as efficient with regards to power demand. This refrigerator also features a 7-inch LCD touch screen that allows control of the temperature and the water filter and provides access to calendars, schedules, nutritional facts and unit conversions, as well as the ability to showcase photos. Thanks to the continuing improvements in home appliance technology, the next time you are doing a tedious task at home and think: 'I wish there was an appliance that could help me with this', it is possible that someone somewhere could already be working on the appliance you need.